Welcome to All Phase Construction Inc.
All Phase Construction Inc. is a General Contractor serving both commercial and residential properties in and around Ely, Tower, Vermillion Lake, Babbitt, and Range Cities, MN. 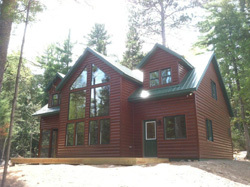 We offer conventional construction with the option of Half Log Siding and Corners for the look of a Log Home without the cost. We perform all phases of home projects; new home, cabin, garage, and remodeling services, but we can handle about anything construction related! All Phase Construction Inc. can assist you with almost any construction work that you are in need of – at any phase of construction. Our name says it all! Small projects, large projects, new home construction, residential, commercial. ASK US ABOUT S.I.P. 'S PANELS - (STRUCTURAL INSULATED PANELS) - An Energy Efficient, "Green" Building" that will Conserve Energy up to 50-70% on your heating and cooling bills. Our Construction team is fully committed to providing you with high quality craftsmanship, attention to detail and timeliness in project completion. Trust All Phase Construction Inc. and rest assured that you are in good hands.